offshore, infrastructure, petrochemicals, metallurgy, fertilizers, etc. There are total 229 Trade or Technician vacancies available in this Engineers India Ltd Vacancies recruitment 2017. Interested candidates may apply online for this EIL Trade/Technical Vacancies online on or before 28-11-2017. Online applications will be received through www.engineersindia.com. Candidates will be shortlisted or selected based on their marks in ITI or Diploma. 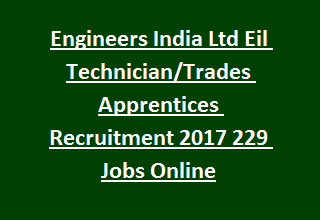 More details about this Engineers India Ltd Trade/Technician Apprentices vacancies are given below. Click here to see the official notification of Engineers India Limited Technician Apprentices Recruitment 2017. There is total 229 apprentices jobs in this EIL recruitment. As on 28-11-2017 lower age limits for Technician Apprentices EIL Recruitment is 18 years. Upper age limit is 35 years. Age relaxation 5 years for SC/ST, 3 years for BC candidates. For Trade Apprentices the candidates must have qualified ITI or its equivalent from the relevant discipline. For Technical Apprentices the candidate must have qualified 3 years Diploma in their relevant field. The selection for EIL Technician Apprentices will be held based on written examination. Personal interview will be conducted followed by certificates verification. Training will be given for 1 year. For trade apprentices 90% wages will be given as per respective state of semi skilled workers. For Technician Apprentices monthly Rs.3542/- per month will be provided. Click here to apply online for Engineers India Limited Technician Apprentices Recruitment 2017. The Eligible candidates can apply through online only. Before applying online must have read the user instructions and official advertisement of EIL. Fill the relevant details in the online application form. Must have uploaded the photo and signature in the specified size and click on submit. Keep the registration details for further communication. Please share this recruitment notification of Engineers India Limited Recruitment Trade and Technician Apprentices Posts to your beloved friends through social networking sites.